Berkeley, CA â€“ 14 June 2011 â€“ Can a near death experience change a brutal killer into a better man? That’s the question Jay Faerber will be answering this September with NEAR DEATH, an all-new creator-owned crime series illustrated by up-and-coming artist Simone Guglielmini. In a departure from Faerber’s work on long-running superhero titles like NOBLE CAUSES and DYNAMO 5, NEAR DEATH is a crime series fueled by regret: After getting a glimpse of his own disturbing life after death while clinically dead for two minutes, professional killer Markham vows to do whatever it takes to prevent his return to the hell he saw before he was revived. He vows to save as many lives as possible, in the hopes that he can somehow balance the scales of judgement. 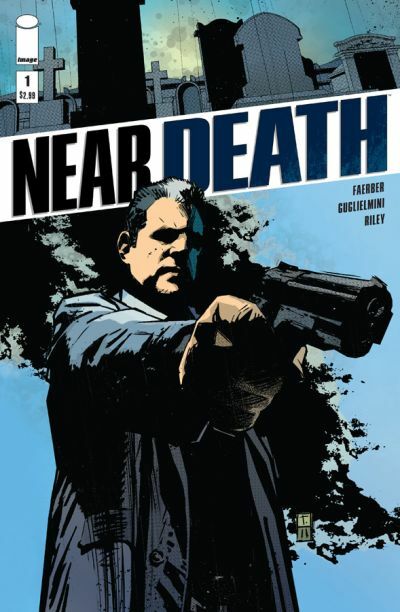 NEAR DEATH #1 (JUL110404), a 32-page full color crime/adventure comic book for $2.99, is available to order in the July edition of Diamond Previews catalog, and will be at a comic store near you on September 21, 2011.